Dr. Wolin and his staff are very professional, yet warm, understanding and they really listen. The surgery results are fabulous. I will recommend Dr.Wolin to anyone considering surgery. I will return to Dr. Wolin for any further surgeries. Thank-you for the outstanding care! I am so happy that I found Dr. Wolin and his Staff, after my first consultation I knew if I was going to have surgery, I wanted Dr. Wolin, it was a facelift consultation. I’d had a face lift 20 years before from a Surgeon in another state, had a very good experience, but the face lift with Dr. Wolin was the so different, for sure I was 20 years older, I felt like I was in the Best Hands possible, I felt so positive from the beginning, from the day of surgery and now I am 2 months out, I could not be happier. Dr. Wolin is a wonderful Surgeon and man, he is also an Artist, I read that about him, it is so True. 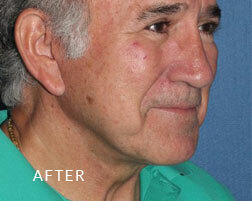 This procedure more than met expectations, as have all procedures preformed by this physician. My life & health have been improved and blessed! Thank you! The entire staff, from Doctor to Front Desk, are excellent in their knowledge and willing to answer any and all questions. They don’t try to sell you things you don’t want or need, and their goal is to meet your goals. They are realistic in how they can help you and they all have a great sense of humor too. I wouldn’t go anywhere else! Dr. Wolin and his team were immediately available with any questions/issues. Pre-op info was thorough and totally prepared me for what to expect. Outcome exceeded my expectations. Dr. Wolin’s high level of expertise as a plastic surgeon is combined with the ability to treat his clients in a truly caring manner. He is surrounded by a staff who mirror his passion for excellence. Do not feel like I have to hide my arms anymore and can now feel comfortable to summer outings in sleeveless blouses. I love my arms being slender again……really did not like the flabbiness prior to the procedure……such a relief that this type of correction can be accomplished. Very professional and I felt like I was at home with my family, it was my second surgery and I’m coming back for my third want. From consult to post, everyone that I’ve had contact with was courteous and caring. The doctor even gave me his cell after release from surgi-site just in case I needed anything. Now THAT’S caring. Everyone is friendly, yet professional. The overnight nurse was FABULOUS! We talked, laughed and watched TV all night! I was well taken care of in every aspect. That’s why I would never consider another practice for any of my cosmetic care and I encourage any and everyone who knows of my procedures to contact your office. Just knew I was in the right place for the surgery I needed. I was totally amazed with all interactions dealing with the surgeries that were performed. Healed with no complications and little to no pain. Heart-felt thanks to all that were involved. Without hurting anyone else, Dr Wolin!!!! I always felt he was an incredible surgeon, but to be the patient was a very comforting feeling. I appreciate even more his artistic talent as an extremely talented plastic surgeon. Doctor and staff were concerned about my surgical recovery and entire well being. Better field of vision. Dr. Wolin and the entire staff are amazing! They really care about each and every patient. From the moment I walked in the door for my consultation, through the follow-up communication after my procedure….the care and results were exactly as described! I highly recommend Dr. Wolin to everyone considering and procedures! Having the procedure was the best decision I ever made. Looking back, I should have had it done much sooner. I decided to have SmartLipo to get rid of stubborn pockets of fat that were plaguing my hips, thighs and upper arms. The overall procedure was fast, with minimal discomfort during the procedure. I was able to return to work the next day. The changes in my body were subtle, but noticeable and within a short time my clothes fit better and my shape appeared natural…I’m very satisfied with the results and would do it again. Dr. Wolin and his staff were helpful, supportive and knowledgeable, explaining the benefits, potential side effects, and expectations. I wouldn’t recommend having one’s arms done at the same time as the legs as there is some mild bruising and swelling, but I found that these side effects were minimized by following the instructions regarding the compression garments. It was the right decision for me and I couldn’t be happier. It has made me feel better about myself, more useful in appearance. Dr. Wolin did a fabulous job on my face. He is very aesthetically oriented and competent. And, he is very empathetic , Reachable, helpful, and just basically the best . His staff are friendly, competent, and helpful. The overnight stay with the nurse in the in office facility was wonderful . Follow up appointments were frequent and convenient. All in all, my experience was wonderful. A wonderful surgeon, great results, and very competent , Kind staff. 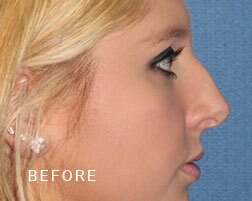 Dr. Wolin is an amazing surgeon and I was very confident that my surgery would turn out as wonderful as it did. He’s personable, always available for questions via text and extremely experienced. He knew just what I needed to get the best results possible. I believe he’s the best in the valley! it’s made me feel so much better about my appearance. The results are so obvious and wonderful. I want to say the end results; however, I still have a bit of time for full recovery. So, my best experience is the interactions with Lynda. She is personable, professional and shows an inordinate amount of care. She is the perfect complement to Dr. Wolin and the type of practice they have. Dr. W. Lynda, Sonja are very professional, yet are easy to approach. Going there is always pleasant even though the procedures may take time to recover from. They all do their best to do whatever they can do to make the experience as comfortable as possible. I have numerous fat transfers by Dr. Wolin. His staff, him and Linda, are all friendly and make you feel that your needs are important. I recommend fat transfers all the time when people ask what I do to take away the wrinkles. It is my feeling that fat transfers are the best value for your buck – you see the most results, and they last longer, when you do fat transfers. This Doctor is very good in every way. He gives his honest opinion, and will not push you into more surgery than you want or need. He is caring, pays close attention to all of your concerns and takes as much time talking with you as you need. I can’t imagine using any other surgeon. All of the staff are great and I love everyone there! The difference is amazing. My body feels like it did 20 years ago. I can move, I can wear tops without the buttons pulling and my shoulders no longer hunch over. I look so much better, but the biggest difference is how normal I feel! The outcome was everything I had hoped for. Dr Wolin and staff were very supportive through the entire experience. Everybody in the office is very professional but still friendly and you feel very comfortable plus the results are always excellent. My 70th birthday is approaching. I hated the way I looked. Now I feel much younger and vibrant!!! I look great. I am still working so my appearance makes a difference to me and to my clients. Skill and personal approach of Dr. Wolin; accessible, friendly, informative, friendliness and quality of care provided by staff. I LOOK GREAT!!!!!!! Dr Wolin is artistic in his approach and tailors the procedures to each patient. One size does not fit all! I have been having procedures done by Dr Wolin over the last 20 years and would never consider going anywhere else. My last one was 10 years ago. 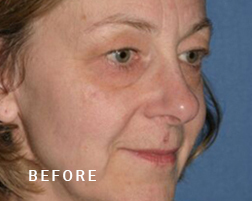 When I had my consultation for this procedure I was happy that the Dr. expanded on my request for a facelift to include other procedures to make the result even more natural and youthful. I’m still in the recovery stage and am improving by the day. I feel good about the results so far and know I will improve even more over the coming weeks. Everyone who works in the office is very professional and easy to talk to. The anesthesiologist was wonderful as well as my in office surgical experience. It’s the only way to go! Thank you! 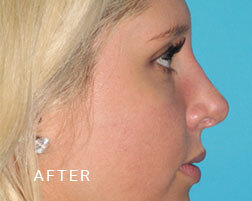 All plastic surgery enhances our appearance as well as confidence. I’ve had numerous procedures done by Dr. Wolin, and have been completely satisfied with everything…..the most professional and competent surgeon ever. He cares a great deal about the surgery being perfect, won’t do too much, and treats all patients with respect. My level of comfort and the level of care I received and the excellent results of my face lift results were what I hoped I am very satisfied with my experience with Dr. Wolin and his staff. They are very professional, efficient and friendly. Feel better about appearance. Pre-surgery and follow up care was great – felt very confident in choosing Dr. Wolin. In the last few years, as I began to notice my aging, I really became concerned with the wrinkles that were appearing – especially the crows feet at the eyes and “laugh” lines at my mouth. Believe me, I was not happy! I received an invitation to attend a free seminar given by Dr. Andrew Wolin at his office on a new procedure, Fractional Co2 Laser with the Pixel Fractional Laser System. I attended to learn more. It was a very informative and I decided I would try the treatment. It was done in his office and was easy and virtually painless. Downtime was nil and I resumed normal activities quickly. As I now I look at myself in the mirror, I truly believe that ten years have melted away. I told none of my friends about the procedure I was going to have and I was amazed at how many noticed the change. Not to say, “What did you do?” But they commented on how good I looked and how rested (and asked where I had gone on vacation!). 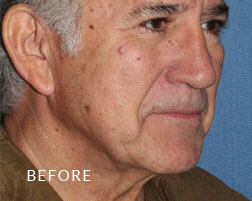 The Fractional CO2 Laser procedure certainly worked for me and I would definitely recommend it. I have been a client of Wolin Plastic Surgery Center for twelve years. 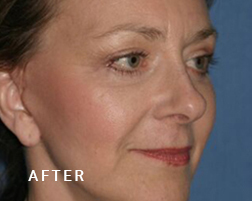 Dr. Wolin has performed two complete face lift procedures (1998 and 2008) (including CO2 laser and fat transfer); each time the results were a younger look; relaxed, refreshed and natural “never stretched tight. Many people have remarked that I look good or rested or ask what new make-up I’m using” no one ever has guessed that I have had surgery. I have also had a tummy tuck “WOW; this is an amazing surgery. The belly of fat plaguing me for years — gone, never to return!! I have also been a patient in several in-office procedures, including Radiesse and Restylane (injected surface fillers), facial skin peels, Smartlipo, etc. Follow up care is remarkable; Dr. Wolin and his entire staff are dedicated and sincerely care about each client and how she/he looks and feels. I have and will continue to recommend Dr. Wolin and Wolin Plastic Surgery Center to anyone who wants to “turn back the clock” and feel better about their appearance. Feel better about myself. I am satisfied with my procedure. I can breathe through my nose! Very friendly people who genuinely cared about the procedure preparation and how comfortable I was. Dr Wolin and his entire staff were extremely professional and listened carefully to what I was looking for. He has a great bedside manner and is extremely easy to talk to. 16 years ago Dr Wolin did a chin implant and my upper eyelids. 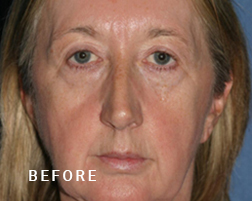 I was so happy with his work then that I flew in from Florida for the following procedures: facelift, eyelid surgery, chemical peel and a little bit of fat transfer. Living in south Florida there are lots of plastic surgeons to chose from but I wouldn’t let anyone operate on me except Dr Wolin. I could not have been happier with the process or the outcome both times. Friendly staff, answered all questions, great follow up, confidence in surgeon. Dr. Wolin and his staff are awesome! They really care about their patients. This was my 4th experience with Dr. Wolin and he is so honest about what to expect…he said he would be 80% effective but it was about 90%! The new office is much nicer than the former facility. Had very little pain, staff so kind and helpful,Dr. always available if I had questions, and I am thrilled with my results! I couldn’t be more pleased. In a short time all went well and I was back to my normal life. I only wish I could afford more of my face to be done. I will be maintaining with products purchased at Dr. Wolin office. My father is from out of state and Dr Wolin and staff couldn’t have been more helpful than his regular Physicans. I guess I was expecting more lift of my wrinkles around my eye area and mouth…The Dr. has told me I can help these with a laser treatment which I will most likely do…Otherwise I look soooo much better !!! The entire process was handled in a professional and warm, friendly manner. They didn’t oversell on aspects of surgery I had no interest in and in fact, undersold one small procedure. I am under amazing care from the entire practice. They continue to be very attentive to my post surgery needs as well. They return phone inquiries, email inquiries in a very timely fashion. They are always on time for my appointments too. I cannot say enough about Dr. Wolin and his wonderful staff. Professional, informative, compassionate, responsive, personable. Dr. Wolin and his staff are the best! They are very professional, caring, and make you feel that you are part of the family. Dr. Wolin takes the time to answer all questions and explains every procedure so you know what to expect. The results speak for themselves…always a job well done! If I were going to have any other procedure done in the future, I would want Dr. Wolin as my doctor. This is NOT my first experience with Dr. Wolin’s outstanding ability, as one could see by the size of my file!!! I wouldn’t consider going to anyone else (and didn’t ever consider that from the beginning). He and his staff are not only highly professional, but are caring beyond belief. They all have a terrific personalities and are easy to communicate with.The long and short of it…they are the BEST. Awesome exceptional surgeon!!!! The best!!! Patient coordinator needs work ….rest of practice was exceptional!!! 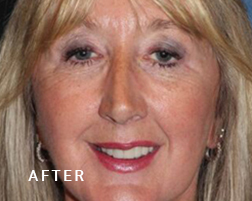 I had a full face lift, fat injections, forehead lift and nose work. This was done at a wonderful surgical center where I stayed over night. I would definitely have the procedure done again, everyone was so attentive and caring. After this procedure I had fat injections repeated. All I can say for a woman 67 – it is great when someone guesses your age in your early 50’s or younger. Dr. Wolin is a try artist and I would have no hesitation to recommend him. Help was always available to answer questions or to advise on after treatment. I felt very much at ease with Dr. WOLIN and staff. They make u feel like your family. I would recommend anyone too go to Dr. WOLIN. I LOVE THIS DOCTOR AND ALL WHO WORK IN THE OFFICE…I’M A STEADY CUSTOMER!!!! HIGHLY, HIGHLY HIGHLY RECOMMEND DR. WOLIN AND STAFF AND HAVE REFERRED MANY PEOPLE TO HIM…AND WILL CONTINUE TO DO SO. HE’S THE BEST! The dr was very confident and caring and honest – I went to 8 different dr.’s and I knew I was going to pick dr wolin before I even got my price. The staff is easy going and they did not act annoyed at all with my many questions. All of the survey questions that I answered were everything I expected from Dr. Wolin and Staff. Most important was that any fear that I was making myself feel, was always taken away by such a wonderful Dr Wolin and his great staff. Dr. Wolin was recommended to me by a very good friend of mine. Having never had plastic surgery before I was nervous. Dr. Wolin and his staff made me feel relaxed and answered all of my questions. Not once did i feel as if they only cared about getting paid. I am THRILLED with my results!!! Thank you all so much!! Great doc. Great staff. Excellent outcome. Dr. Wolin, Lynda and entire staff are very caring as well as exceptionally well qualified. I have used Dr. Wolin twice before and wouldn’t consider any other Plastic Surgeon. Wonderful staff, very nice result. Dr. Wolin and his staff are very professional people who are caring and sensitive to your needs from consultation to post-surgery. My personal expectations have been exceeded by Dr. Wolin and his staff. The results of my CO2 laser and fat transfer are phenomenal, without people even noticing that I had it done. I will recommend Dr. Wolin and Wolin Plastic Surgery Center to anyone who desires to turn back the clock or just feel better about their appearance. I had to change plastic surgeons “midstream” so to say. Dr. Wolin came very highly recommended and has lived up to that recommendation and then some. I am very happy to be under his care. His attention to my requests, needs and desires is always there! Thanks for everything! Communication, customer service, professionalism and results. This is the fifth procedure other than Botox and fillers that I have had done with this office. The doctor is very professional and experienced. I have had seven of the procedures on the list and have had only great results. The result always was very natural. I think we can spot these types of surgeries on others from across the room. Dr. Wolin’s work is the very best on all levels and Lynda is awesome and it would not be the same without her. I was well prepared for my surgery. The outcome was fantastic. It’s been 18 months since my procedure and my face still looks full and youthful. The experience was very professional, at the same time, I felt very comfortable and they always took time to address any questions I had. Dr. Wolin and his staff truly care about their patients. I always felt well cared for. I would not go to anybody else. Both Lynda and Dr. Wolin were extremely caring and I truly felt I was in great hands. I am very happy with the results and would gladly refer anyone to this office. The doctor is the most competent caring surgeon I have ever met! He listens and genuinely cares and hears your concerns and is HONEST!!!! There are not many honest people left especially doctors and he is a surgeon who can say what he wants but he guides directs and is sincere in every interaction and a genius with his skills and mind. he has made me feel whole and believe I am an ok person. His demeanor character competence and genuine compassion is remarkable and there are no words to explain how AWESOME HE IS AS A DOCTOR BUT AN INDIVIDUAL WHO SINCERELY CARES ABOUT HIS PATIENTS AND DOES Excellent work. Just AMAZING. When you know someone is a master at their skill it makes everything fearless and brings confidence inside and out!!~! His staff create a calming reassuring environment and they know who you are and that you are real. They are compassionate understanding and ALWAYS available for questions emergencies fears and tears.. I CAN’T SPEAK ENOUGH OF SUCH A HIGHLY QUALIFIED PROFESSIONAL SURGEON WHO SINCERELY CARES ABOUT YOU AS A PERSON AND LISTENS AS WELL AS HEARS.. REALLY AWESOME STAFF DOCTOR OFFICE INCREDIBLE!!! A BLESSING!!!!! My breast revision outcome was fabulous. I’ve had three breast surgeries since 1987 and beyond none, this was the best.. Dr Wolin really knows what he is doing. Dr Wolin was extremely responsive to all specific problem areas I pointed out. The results were more than satisfactory. I would recommend him anytime. I have had two procedures done. Breast reduction and face lift with fat injections. My neck is absolutely awesome, however, I was a little disappointed with the fat injections, they did seem to drop— overall, I am happy with both procedures. After looking at before and after pictures, wow what a great job!! Dr. Wolin and staff are very professional and make you feel comfortable. The Wolin Team provided an excellent experience! They are all amazing! Interviewed many other surgeons and no one compared. Dr. Wolin and his entire team were professional, skilled, caring and competent. Start to finish, just an amazing experience. After much research years ago I chose Dr. Wolin to do my Co2 laser and returned to him just a year ago to repeat the procedure. Trust is the first thing you must have in your doctor and believe me Dr. Wolin is the best. I was so happy to see that he was still in Scottsdale when I returned to Az. Great recommendations by dr wolin…and great result from those recommendations. Very satisfied… if I plan on any other plastic surgery I will definitely return. Dr. Wolin and his staff are nothing short of THE BEST! He is excellent at what he does and the office and nursing staff are exceptional as well. I wouldn’t go to anyone else for any of the procedures that are offered or that I might need in the future. This was not my first surgery performed by Dr. Wolin, and consequently I was more than satisfied with the other results, resulting in my wanting to continue to have him as my surgeon. I cannot say enough good about him and his office. The entire experience was streamlined, organized and respectful of my concerns. There was good anticipation of related issues associated with recovery, so I’d felt fully prepared to expect what the reality of the experience would be, both in terms of timing and how I’d feel. There were no surprises, which was perfect. Dr. Wolin is an artist, and knows to enhance with subtle touch, resulting in a completely natural turning back of the clock. I absolutely loved Dr Wolin. He is personable, friendly, highly skilled and very caring. Also every one of the staff members in the office really care and get to know you. It’s like a big family there. Love them all and I drive 30 minutes to get there for facials and Botox as it’s worth the drive. I would recommend them to anyone. Office staff is friendly and informative. Only reason to put “satisfied” with results and not “highly satisfied” is because we’re still waiting to see final results.